These are easy to make, are elegant to serve and have no fat… I have no objection to fat but as a nice light dessert this can’t be beat! To form these meringue shells, you don’t need a pastry bag or decorating tips, just a regular tablespoon. 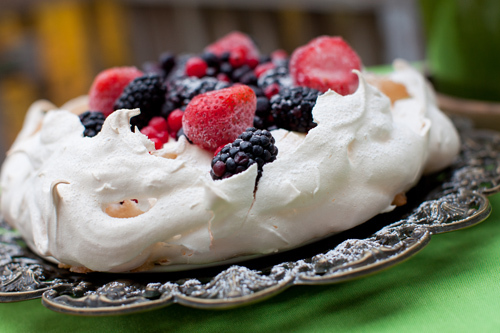 Once made, these meringue shells make an impressive, quick dessert filled with fruit. 1. Adjust oven rack to lower middle position and preheat oven to 225 degrees. 2. Sift 2 tablespoons granulated sugar with confectioners’ sugar; set aside. 3. Place egg whites in large bowl of electric mixer. Using whisk attachment, whip them on low speed just until frothy. Increase speed to medium, sprinkle in 2 tablespoons reserved granulated sugar, and continue whipping to soft peaks. Gradually add 1/3 cup reserved granulated sugar; continue whipping to stiff, glossy peaks. Stop mixer; rub some meringue between your fingers. If smooth, proceed to next step. If still grainy, continue beating until smooth. 4. Sprinkle sifted powdered-sugar mixture over meringue; fold in with rubber spatula until just incorporated. Fold in ginger and cinnamon. 5. FOR FREEFORM MERINGUE SHELLS — Use a compass or large bowl or glass to trace 4-inch circles on parchment paper. Lay parchment on baking sheet and dab a small quantity to tack down corners of parchment paper while you work. Use the back of a spoon to carefully spread about 1/2 cup meringue inside each traced circle. Still using the spoon, form an indentation in the center, forming a decorative cup about 1/4 inch thick in the center and 1-inch high around the edge. Shape a couple of 1 1/2 inch disks with the spoon and remaining meringue. These extra meringues are use to test for doneness. 7. Toss berries, sugar, and orange zest in small bowl; let stand until light syrup forms, about 30 minutes. Add papaya and toss gently. 8. Place one meringue shell on each serving plate. Divide fruit and syrup among shells. Serve immediately.